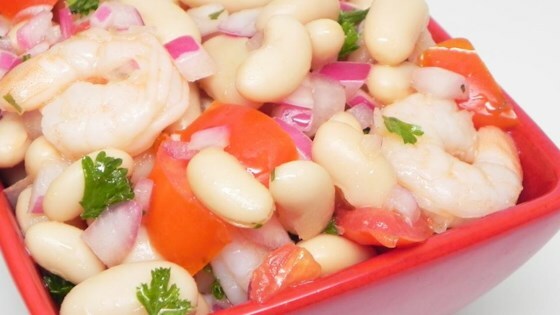 "A delicious chilled salad of white kidney (cannellini) beans and shrimp with a zesty herbed dressing. This may be eaten immediately, but is best when left refrigerated several hours, or overnight." In a small bowl, whisk vinegar, oil, sugar, cilantro, basil, and tarragon until well blended. You may adjust these seasonings to your personal preference. In a separate bowl, toss together the beans, tomato, onion, and shrimp. Pour dressing over salad, and toss again to coat. Cover and refrigerate several hours, or overnight, to develop flavors. This wasn't bad, just not as good as I thought it would be. I love all the ingredients so I guessed that I would love them all together. I didn't.